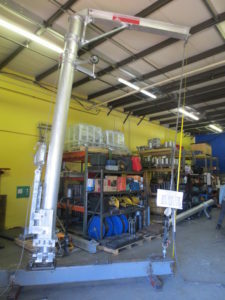 Load Testing – Summit Anchor Co.
How does Summit Anchor know that we have the best anchor products? We systematically test representative anchor models in our Frederick, Maryland facilities to verify that our equipment complies with OSHA regulations and ANSI/IWCA I-14.1 Window Cleaning Safety Standards load requirements. If it’s not safe, Summit Anchor won’t sell it. Summit Anchor’s core value is respect for life, so we want all our products to be safe. Through rigorous testing, Summit Anchor ensures that its products and equipment hold up under use. All equipment that we manufacture is supported by test report documentation of the raw materials and of the finished product. You can go to the edge with Summit Anchor, certain that its equipment will meet load requirements. OSHA 29 CFR 1910.27 – Before any rope descent system is used, the building owner must inform the employer, in writing that the building owner has identified, tested, certified, and maintained each anchorage so it is capable of supporting at least 5,000 pounds (268 kg), in any direction, for each employee attached. The information must be based on an annual inspection by a qualified person and certification of each anchorage by a qualified person, as necessary, and at least every 10 years. Summit Anchor performs on-site reviews of suspended maintenance equipment to verify that a building roof has sufficient anchorages that comply with safety standards. The consultant considers such factors as anchor spacing and independence of anchorages for fall arrest and fall protection. Our rooftop review includes a written report with any modification recommendations. Contact Summit Anchor today to set up a rooftop review. Question: Is certification of anchors required? Answer: Yes. According to OSHA 29 CFR 1910.27: The employer must ensure that no employee uses any anchorage before the employer has obtained written information from the building owner that each anchorage meets the requirements of paragraph (b)(1)(i) of this section. The employer must keep the information for the duration of the job. Question: To what standard can anchors be certified? Answer: Rope descent systems and other suspended access systems can be certified to the OSHA 1910.27 Rope Descent Systems Window Cleaning Safety Standard. This standard is required to be met by all buildings with anchorage by November 20, 2017. OSHA Regulations (Standards-29 CFR) 1910.28 Safety Requirements for Scaffolding. OSHA Regulations (Standards-29 CFR) 1910.66 Powered Platforms for Building Maintenance. Note: Some states and municipalities (e.g. State of California and New York, City of Chicago) have additional requirements that apply to window cleaning equipment. Question: Does having anchorages certified to meet OSHA 1910.66 mean that the entire building is safe for rope descent and window cleaning operations? Question: What load capacity should suspended access equipment be certified to? See Summit Anchor specifications for more information. Question: How can building managers and owners determine if their existing roof equipment is in compliance with current standards? Answer: Summit Anchor performs on-site reviews of suspended maintenance equipment to determine its compliance with safety standards. Our rooftop review includes a written report with any modification recommendations. Contact us for details. Question: What is the purpose of a log book and is it required? Still have questions regarding fall protection and suspended maintenance requirements, design and equipment? Call Summit Anchor today and a consultant will contact you.